Super Typhoon Yolanda brought a lot of misery to our nation, especially to the people of Visayas. There were a lot of loss in lives, property, and source of living. It was a very unfortunate event that noone has foreseen, and that no one wanted to happen to our countrymen. Let us not let the survivors also lose their hope of recovering from the tragedy. We should contribute in our own little way any help we can to help them rebuild their homes, and their lives. We are so blessed that many are capable and willing to help out the survivors using the talents and skills given to them by the Lord above. We are very fortunate that everyone is doing their share to help reach out to the survivors by sending out their love through means of relief goods, cash donations, moral support, and of course...prayers. The country's best speakers come together to give a series of benefit seminars to raise funds for Yolanda Survivors. 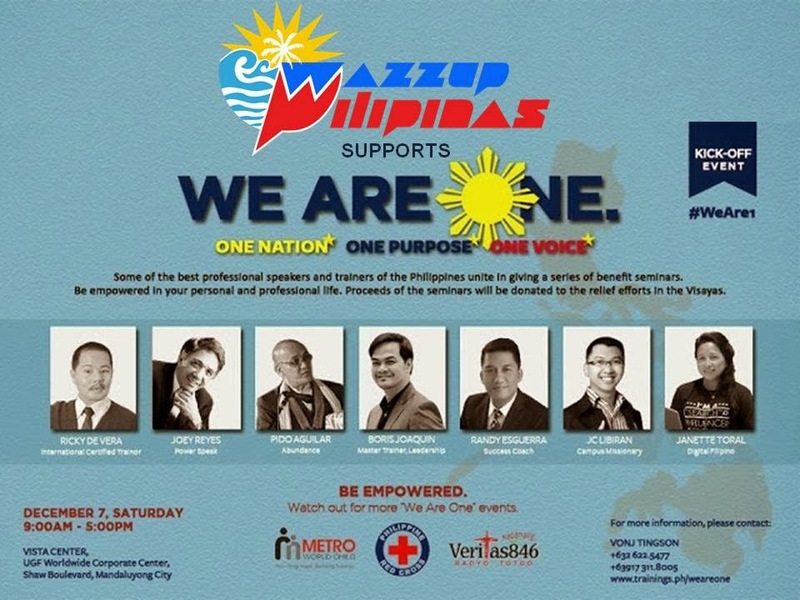 Be empowered in both your personal and professional life while helping our countrymen in the Visayas. We Are One will bring every one to help out in their own little way through a means that is both compelling and meaningful thus eventually empowering for it is expected to give you the drive to do more of what you can give. 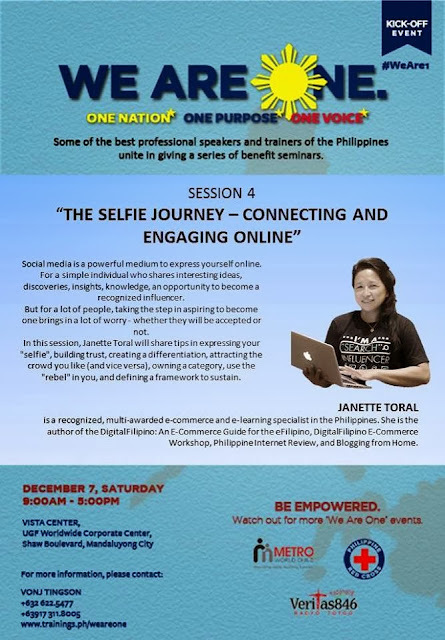 I am very much interested in listening to the "The Selfie Journey - Connecting and Engaging Online". As the topic description relates, we have been using social media as a means to express ourselves. Before we could do nothing but to mull in one corner and talk to ourselves, nowadays it is very easy to broadcast to the world what we feel. We now use social media to connect with people and make them engage with us. Everyone worries about being accepted or rejected. It's but natural to feel alienated or welcomed if you can't seem to engage with people. "Hey! How come no one is "liking" my status post? ", "I only got two "Likes"?, "Why is there noone retweeting my tweets? ", " I hate to rant but no one is commenting on my rants!" - and plenty more examples of sentiments which are obviously a call for notice. "Pansinin nyo naman ako! " I may be taking the word "rebel" in a different light, but I know it means to excel in a positive way. Thus the need to really listen to this talk and learn more about the "selfie" in me. Plus many other topics from several great speakers. Its worth every centavo of your donation that is going to a good cause - and at the same time giving you great learning discoveries that you thought you already knew. Secretary General of Philippine Red Cross Gwen Pang will be one of our guests. Participating speakers are Ricky de Vera, Boris Joaquin, Randy Esguerra, Janette C. Toral, Jc Libiran, Pido Aguilar, Raju Mandhyan, Warren Domantay, Polo Ablazo, Al Ian Barcelona, Boom San Agustin, Joey P.Reyes, Ivy Villanueva Lloyd Luna Pocholo Gonzalesand several others. You are welcome to attend We Are One Kick Off Event-- A Day of Empowering The Self (through Life and Skills-Building Talks and Workshops) this December 7, 2013 (Saturday) -- at the Vista Center, UG/F Worldwide Corporate Center (along Shaw Blvd. across Star Mall), facilitated by our country's bevy of esteemed empowerment coaches and speakers. You may call Vonj Tingson via 0917 311 8005 or +622-5477 for details.